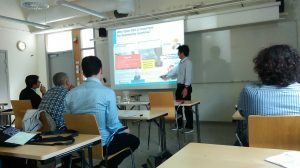 On Wednesday June 13, Agung Indrajit and Frederika Welle Donker presented their research at the AGILE conference in Lund Sweden. Agung’s paper was entitled ‘Prospect of open SDI in Developing Countries: Case Study Indonesia’. In his presentation he provided an overview of the open spatial data infrastructure in Indonesia acknowledging the importance of open data and open processes. The lack of openness has resulted in conflicting data within government about the need to import rice, while open data in Indonesia highlighted overlaps in provided permits to exploit land. In the latter case several high level bureaucrats were taken to court. Frederika presented in her presentation ‘Societal costs and benefits of high-value open government data: a case study of the Netherlands’ the conclusions of the work of the Knowledge Center for the Ministry of the Interior.